"Brother John and I just got back from Rocky Point (Puerto Penasco) Mexico. Here are fish we caught on the first day. A 35lb. 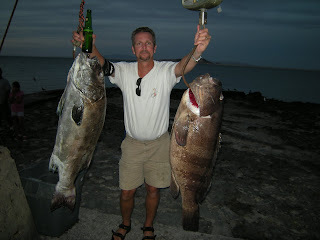 Black Sea Bass (left) and a 38lb. Pinto Bass (right)." Bill Moody - Desert Mountain Tile & Marble Inc.
OK, So Tell me ... What Do YOU Want ...?